Could there be anything truer than this, when it comes to our homes? As is the case with everything else, every homeowner desires to be in sync with the latest interior design trends. It could be a whole new theme for the bedroom, a different colour scheme for the living room, or a smart kitchen equipped with the latest accessories. There are no limits to the imagination when it comes to how your home should look - but, there is a limit to how much you can shell out of your pockets! For every layer of paint and a tile in flooring, there is an associated cost. And to be able to bear that cost, every cautious homeowner determines a budget, a limit to his/her dreams of a grand home! But, is it possible to get a close-to-accurate estimate of just how much getting that dream home would cost you? Wouldn’t it be a relief to know that what you want is well within your means? Turns out… It is possible to get quick estimates for your dream home! Say hello to Hipcouch’s Calculators! Use Hipcouch’s Calculators To Get Quick Estimates For Your Home! 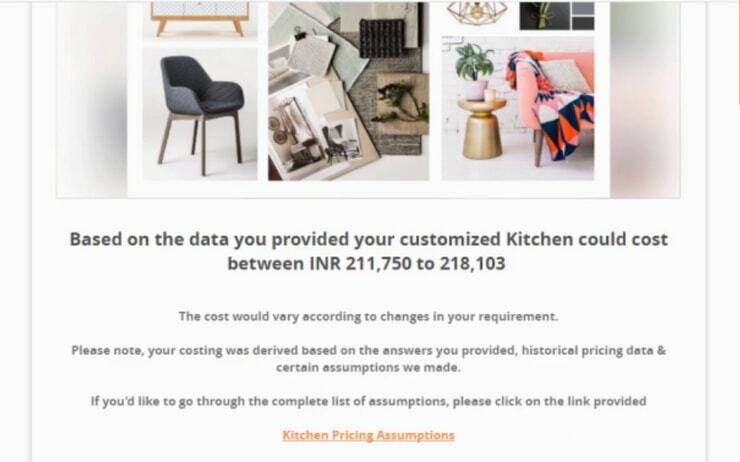 Hipcouch’s calculators, a product of painstakingly researched data and the wisdom of multiple interior design experts, are an AI-driven answer to a homeowner’s cost-related woes. Whether it’s for your living room, bedroom, kitchen, or office, Hipcouch’s Calculators have got you covered! And using it is no rocket science either - it’s all online! Here’s a quick guide to get quick estimates for your home! Follow the simple steps below to get instant estimates for your home! Click on ‘Get A Cost Estimate’. Answer the questions that pop up - these are based on certain assumptions arrived upon with the help of interior design experts associated with Hipcouch. For eg. If you wish to do up your 2 BHK Apartment, you just need to give us the carpet area, the kind of furniture you need in each of your rooms, the materials and finishes, the flooring, etc. All that’s left to do is hit ‘Submit’ and get an instant estimate of how much the whole deal will cost you! Don’t sleep on your dream to have a stylish and beautiful home! Lay all your budget woes to rest with Hipcouch’s Calculators! If you are unsure about how to use Hipcouch’s Calculators to get instant estimates for your home, here’s a live video to help you through the process! Newer PostHow Do You Calculate The Interior Design Cost For A 2BHK In Mumbai? Older PostWhy Getting An Online Interior Designer Makes Sense?